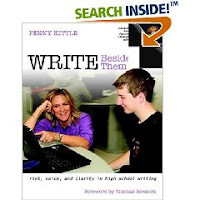 Penny Kittle is a high school teacher from New Hampshire. She writes. With her students. Every single day. And she has written four books- INSIDE WRITING (with Don Graves), THE GREATEST CATCH, and PUBLIC TEACHING. I'm just finishing Kittle's newest book, WRITE BESIDE THEM, and it's terrific. Kittle takes us right into her classroom at Kennett High School. She shares vignettes. She shares mini-lessons. She shares her writing. She shares kids' writing. She shares the forms she uses with kids. This book is so, so helpful. And so, so readable. And so, so inspiring. And there's a DVD that goes with it. Kittle believes that writers need to write lots and to be expected to produce high quality finished products. They need to do this in classrooms where the teacher is also writing, struggling and learning, and producing high quality finished products. Kittle believes, adamantly, that writers need feedback that is both supportive and challenging. Kittle believes that kids need to be allowed to work on a piece until they believe it the very best it can be, until they believe it is finished. What is writing for? What do we teach and why? It can't be only for next year-- or college-- or the April test. Sometimes it is for now: a path through dark days. We teach life writing, not school writing, life writing in all its complexities: the tools for the tasks we can't anticipate. It is about this day-- this lesson-- what students can reach for that will matter-- for the lives stretched out before them peppered with joy and loss. What power-- what importance-- lies in the blank lines of an open notebook. Penny Kittle is an amazing teacher- someone who obviously cares hugely about kids and writing. Penny Kittle is a brilliant writer and storyteller- passionate, serious, also very funny. I wish I taught next door to Penny Kittle. I wish I was in a writing group with her. I wish she was my best friend. Penny Kittle is definitely one of my heroes. Just spent an hour doing homework with my ninth grade son. He has a packet (probably the first of 36, but who's counting!) that he has to complete by next Wednesday. This first packet was mostly test prep stuff, editing sentences and paragraphs, reading short passages and answering questions, etc. Isaiah's been doing about two pages a night, and only has a couple of more to go before Wednesday. I've decided it's a lot harder to edit those editing exercises than it is to edit my own writing! One of the pages Isaiah still has to do is a writing prompt, "Write about the most serious problem you think will face your generation as adults." I can't wait to see what he writes. Anyway, I got done, and came upstairs to get my computer so that I could do my work for school for tomorrow. Checked my favorite teacher blog, A Year of Reading, and discovered that Kelly Gallagher, one of my hero of the world high school teachers has a new website! So then of course I had to hop over there and check that out. My favorite section was the RESOURCES section. Gallagher assigns kids weekly articles, real articles, that actually come from newspapers and magazines. The kids have to read them, annotate their thinking, then write some kind of response. I'd love to help with homework like that! Gallagher also has a list of the books his high school book club read. I had only read a few of those and can't wait to share the list with my book club! My friend Laura Benson teaches kids (and adults) that books can serve as mirrors and windows in our lives. They are mirrors when they help us look inside and understand ourselves better. They are windows when help us to look outside of ourselves, and understand the world. 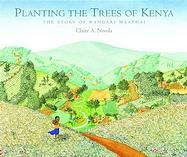 PLANTING THE TREES OF KENYA is a new mirror book for me. Wangari Maathai, winner of the 2004 Nobel Peace Prize and founder of the Greenbelt Movement, grew up in Kenya, where lush vegetation was plentiful. Over the years, however, more and more land was cleared, and when Wangari returned from college in America, she found the vegetation gone and the land dry. How could she, as one person, bring back the trees and restore her country? This is a powerful THREE CUPS OF TEA kind of picture book that speaks volumes about how one person can bring about change in the world. I'm looking at the kids at my new school-- many of them seem pretty rough and tough, and I suspect that they have seen plenty of ugliness in the short lives. I'm wondering, then, what kind of beauty and change this book might inspire them to bring about in their neighborhood/world. P.S. The art in this book, kind of a blend of folk and impressionism, is gorgeous! Mike and Conrad are best friends. They eat together, read together, play together, and that's the way it's always been. Things change, however, when Victor moves to town. Victor is cool, way cool, and has the sunglasses to prove it. Soon Conrad and Victor are doing everything together, and Mike is left out. Kids love the rhythmic, sing-songy playgroundish language and funny, collage like illustrations of Alexis O'Neill's RECESS QUEEN (another great back to school read aloud- it's pictured here because I can't find a picture of WORST BEST FRIEND) and WORST BEST FRIEND is another sure winner that kids will reread, and reread, and reread, and chant on the playground. On a deeper level though, WORST BEST FRIEND is one of those books kids NEED in their lives. The first couple of reads, they enjoy the book, notice new things in the illustrations, read along. The third or fourth time, though, they talk about heart issues- what it feels like to lose a best friend, being left out, loneliness, loyalty. All kids lose a deep and treasured friend at least once in their lives, and books like this make a very hard experience a little less painful. I'm sure this book will disappear, and I'll replace it more than once. Close the home-run games we won. I've spent the past couple of weeks reading books about coaching, in preparation for a class I taught last week. COACHING FOR BALANCE is one I absolutely loved, and is the one I ended up using as the text for the course. 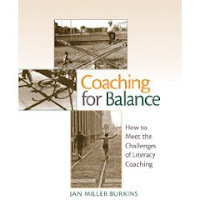 The author, Jan Miller Burkins, is an elementary literacy coach who is amazingly articulate about the complex issues facing a literacy coach. She shares several really helpful theoretical frameworks-- my favorite, and one that I know I will think about lots as I work this year, was a model for introducing a new practice, then supporting teachers as they implement it. In honor of Jack Black, who may never be potty trained, but does know how to sit for a biscuit! I can't bear that trusting face! About a week ago, I was hugely honored (maybe flabbergasted is a better description) when Mary Lee chose Carol W's Corner for the Arte y Pico award. On their blog, the creators of this award describe Arte y Pico as "Lo Maximo." They say "this phrase will never find their counterpart in English, but if it did, it would mean something like, 'Wow. The Best Art. Over the Top.'" The idea is that you then choose five other blogs that you think are deserving of this honor and present them with this award. I AM A BIG, FAT CHICKEN!!!!!!! And an amateur!!!! It feels way, way, way presumptuous to ask five other people who are way more famous and way more expert at blogging to respond to my very feeble efforts. If I was brave enough to choose, though, here are some bloggers I would recognize (several have already gotten the award). I would also love to meet these people for coffee!!!! 1) Franki and Mary Lee (readingyear.blogspot.com)- they know the best, best, best new children's books. And Mary Lee is originally from Colorado. And she has been so very kind in helping me get my blog up and running. 2) Cynthia Lord- I loved, loved, loved RULES and can't wait for her second novel to come out. I read this blog every single day, and every single day I am totally blown away by the writing, and also by the grateful and gracious way in which Cindy (it even feels presumptuous to call her by her first name!) seems to live. One of my most recent favorite posts was when Cindy wrote about playing Pooh Sticks when she and her daughter visited the college her daughter will attend this fall. I also love Cindy's husband's beautiful photography. 3) Barb O'Connor- Another one of my writing heros. My first read aloud this year will be HOW TO STEAL A DOG. I especially love her Tuesday posts when she gives advice to writers. 4) Two Writing Teachers- another blog I read and learn from every single day. Stacy and Ruth seem to teach so artfully and so brilliantly. I would also love to share stories with Ruth about her family, because I think we'd have a lot in common. 5) The Boy Reader- Kyle and I taught together for five years, and started our blogs at about the same time. Kyle is one of the most well-read and versatile readers that I know. He also teaches with more joy and more laughter than anyone I have ever known. 6) Finally, I have to share Jazz Theologian. This blog is by my pastor, Robert Gelinas. Robert is an amazing man, a follower of Christ, a Bible scholar, a father of six (five adopted), someone totally committed to living his faith in the world. He is also passionate about jazz, and has a book coming out in the next year. Robert often has interesting links to other posts. He always makes me think about my faith.